Place a wide-mouthed, heavy-bottomed vessel in Medium-High heat. [Wide-mouthed vessel so that the carrots get cooked fast and uniform. Add the shredded carrots into the ghee and mix well. Fry until the carrots turn pale. This process takes around 10 minutes. Add the milk. Allow the milk to boil. Takes 5 minutes. Let the carrots get cooked well in the milk. The carrots should drink in all the milk. This will take 20-30 minutes. Stir the content from time to time to prevent scorching. Once the milk is completely drunk, add in the sugar. Mix well. Reduce flame to Medium. Stir at regular intervals. Place a small wok in medium flame. Roast the Delinut Cashews with 1 tsp. ghee. Remove seeds from one cardamom pod and powder it. Add the roasted Delinut Cashews and powdered cardamom. Mix them well. Cook the halwa stirring occasionally until the added ghee separates out. This takes 10 more minutes. 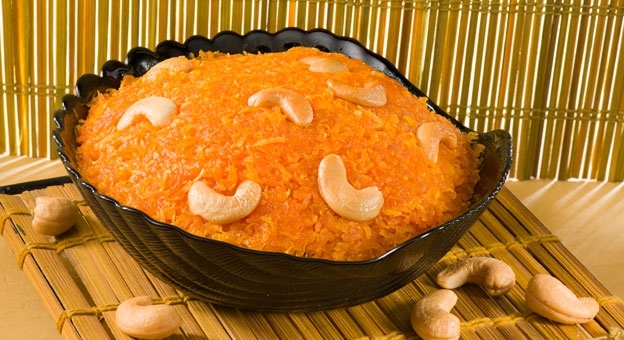 Serve the Carrot Halwa hot, preferably warm.